This system is inspired at the forex system Written by Alorente Extreme TMA Bands system. The main difference is that this forex system is based on the TMA Bands NK, while the forex system of Alorente, is based on Extreme TMA Bands. TMA Slope normalized = Slope of the Tma line. Pivot Distance = Distance to the nearest Pivot point. (Please don't ask me about this. It works for me on my broker. It can certainly be off by a few pips but this is related to the brokers High,Low,Close prices from the previous day. Not any time offsets) Daylight savings is this weekend here so who knows what that is going to do to our trying to all get on the same page. MA Crossover = This is the original MA crossover used as confirmation in the direction of the trade. It is not a MACD but the crossover of a single moving averge displaced in time. This is set the same as the defaults in packet do not change the 1 value in shift unless you know what you are doing. Heiken Ashi = The heiken ashi body size and direction. Or basically a crossover of a typical price (OHLC/4) over a moving average of that price. 1. Look for the first bar close of the TMA Slope normalized indicator that moves above 0.50 value. 2. Enter long when the first HA candle turns Blue. No need to wait for a close of the candle. 3. 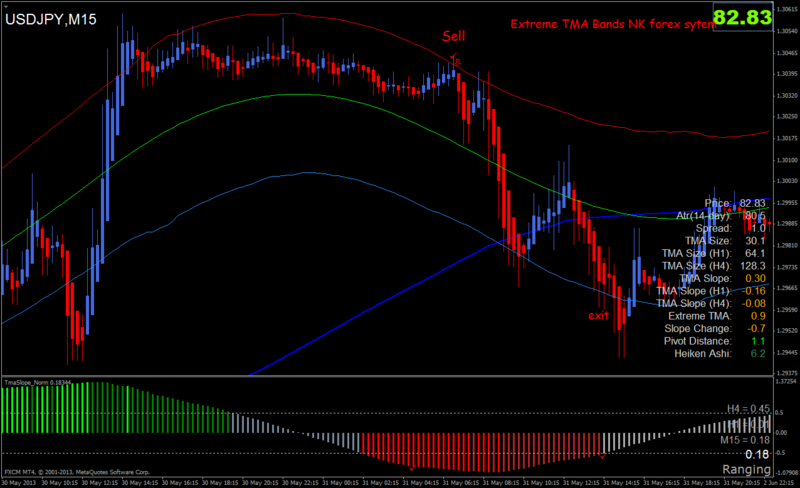 Exit long when the first bar close of the TMA Slope normalized indicator moves below 0.50 *value. 1. Look for the first bar close of the TMA Slope normalized indicator that moves below -0.50 **value. 2. Enter short when the first HA candle turns Red. No need to wait for a close of the candle. 3. Exit short when the first bar close of the TMA Slope normalized indicator moves above -0.50 value. At middle TMA Band NK. Place Stop loss at the previous swing high or low and move stop loss at entry point after 20 pips in gain. 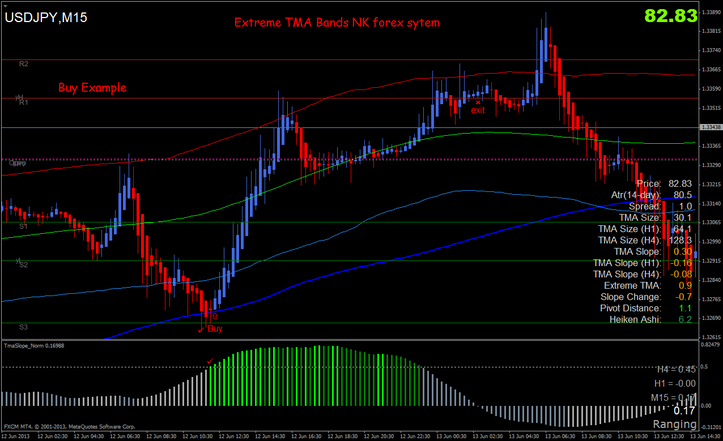 In the pictures Extreme TMA Bands NK forex system in action. First of all, thanks for sharing your strat!